Cathy Doll recently launched their newest Brow products, one is called the Cathy Doll Tattoo Tint Pack (which is a peel-off product and lasts up to 3 days), and another one called RealBrow 4D Tattoo Tint which I am reviewing today. It comes in a regular pen-type packaging (like liquid liner or brow liner) but once you open the cap, that's were the uniqueness comes in. Pen type, easy to bring along during travel. The applicator is indeed very easy to use. Result is very natural as it creates hair-like strands. Comes in 3 shades, all 3 shades are what we need as Pro MUA. Stays until removal if you let the product set for at least 10 minutes. Can be easily removed with regular eye makeup remover. Instantly dries up after application. May not work for all skin types, if you have extremely oily skin especially the skin around the brows, it may take a bit of effort for the product to stick on skin. Product may slide off a bit especially for users with oily skin. Just like most liquid liner pens or brow liners that are housed in similar packaging, you can't seem to know when you used up the product or when to repurchase. An innovative applicator that actually works! Very easy to apply and use. For oily skin users, or those who tend to have "oily brows", best to set the brows with translucent powder before applying the 4D Tattoo Tint. Best used for those who have sparse brows. If user already have thick brows (like me), the effect of using this product may not be as effective. Mix and match brow products to achieve desired results. For color treated hair, I prefer to finish up with a brow mascara as this product fills in brows but doesn't tint brow hairs. I won't purchase for personal use as this isn't what my thick and full brows need. First time brow product user. 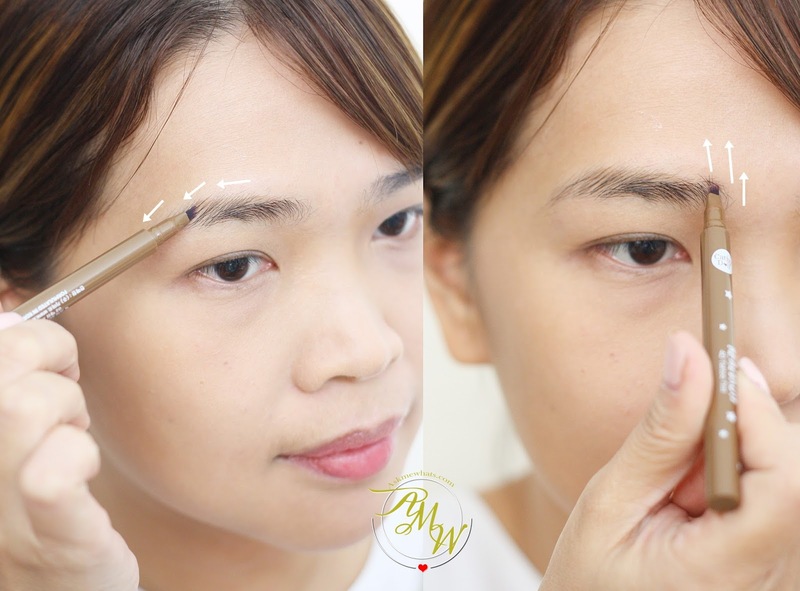 Love the 4 tipped applicator which can easily create 4D brows. Light Brown is extremely light, so I felt that it is still needed to follow up with a brow powder or other brow products if you use this. Ask Brown is the most in demand shade as I was told. This gives out a perfect, ash brown shade (no red tone) which works so well on most Filipinas. Dark Brown is a perfect shade for those who have sparse brows! This color is just right for those who have black or dark brown hair. For demo, I used 01 Light Brown. As for application, I like to start from the center of my brows and gently draw from inner to outer corner with the "arrow strokes" drawn on photo below. For final touch, I like to flip the pen drawing with upward strokes to create a very natural-looking brows. Like it was never drawn. 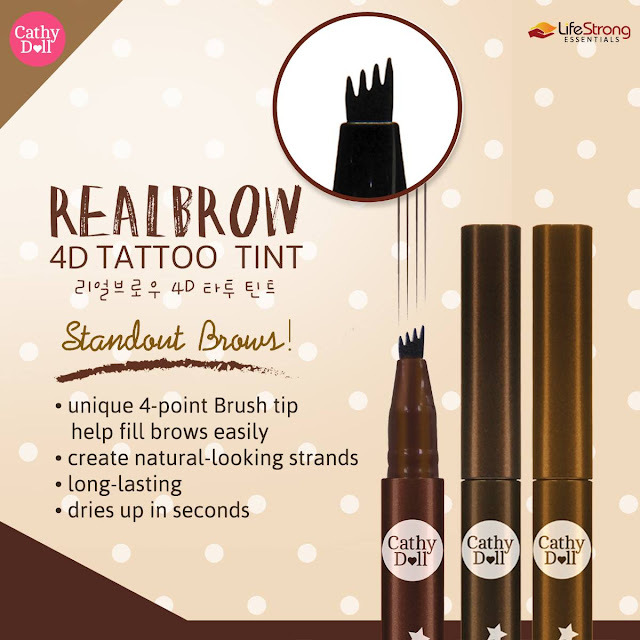 Have you seen Cathy Doll RealBrow 4D Tattoo Tint in stores near you? Do you think this is a new type of brow product you would want to try? Whoa it looks like you've grown you brow hair in a minute.